Several of W.G. Sebald’s earliest monographs deal with German-language literature and authors and are extremely difficult to find in first editions. His MA thesis Carl Sternheim: Kritiker und Opfer der Wilhelminischen Ära (Stuttgart: W. Kohlhammer, 1969) (crudely translated as “Carl Sternheim: Critic and Victim of the Kaiser Wilhelm II Era”) and his Ph.D. dissertation Der Mythus der Zerstörung im Werk Döblins (Stuttgart: Klett, 1980) (loosely translated as The Mythos of Destruction in the Work of Döblins) were monographs on single authors. Sternheim (1878-1942) was a German novelist and dramatist, while Döblin (1878-1957) made his name as a German expressionist writer and is most remembered for his sprawling novel Berlin Alexanderplatz. 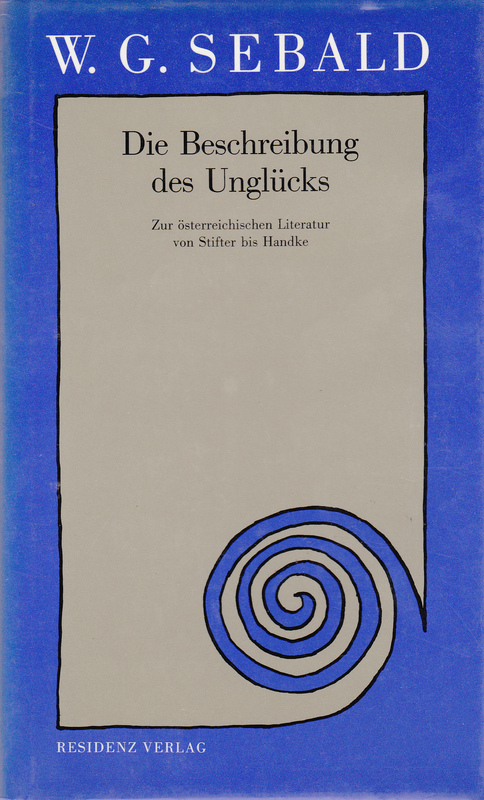 In 1985, the Austrian publisher Residenz Verlag published Sebald’s Die Beschreibung des Unglücks: Zur österreichischen Literature von Stifter bis Handke, an anthology of previously published essays from 1972 through 1985. The title might loosely be translated as Describing Disaster: On Austrian Literature from Stifter to Handke (even though one author discussed – Kafka – can hardly be considered Austrian). It included essays on Adalbert Stifter, Arthur Schnitzler, Hugo von Hofmannsthal, Franz Kafka, Elias Canetti, Thomas Bernhard, Peter Handke, Ernst Herbeck, and Gerhard Roth. Only the essay on Hofmannsthal had not been published earlier. Unheimliche Heimat: Essays zur österreichischen Literatur (a loose translation might be Uneasy Home: Essays on Austrian Literature) was published in 1991, also by Residenz Verlag. It, too, is an anthology of previously published essays from 1976 through 1989 on Charles Sealsfield, Karl Emil Franzos, Peter Altenberg, Franz Kafka, Joseph Roth, Leopold Kompert, Hermann Broch, Jean Améry, Gerhard Roth, and Peter Handke. Only the essay on Handke had not been not published earlier. The first edition is less elegant than the earlier volume by Residenz Verlag, being bound in bright orange boards with a somewhat bolder typeface used on the black-stamped spine. The simple dust jacket is orange and brown. Since none of these titles have yet been translated into English, the only way a non-German reader can sample these early critical writings is to seek out the two essays on Kafka, both of which are on The Castle and have been published in English-language sources. The essay from Die Beschreibung des Unglücks,The Undiscover’d Country: The Death Motif in Kafka’s The Castle, appeared in the Journal of European Studies (2), 1972, while the essay from Unheimliche Heimat,The Law of Ignominy: Authority, Messianism and Exile in The Castle, can be found in the anthology On Kafka – Semi-Centenary Perspectives, edited by Franz Kuna (London: Paul Elek, 1976). Kuna was Sebald’s colleague on the Department of European Studies at the University of East Anglia. 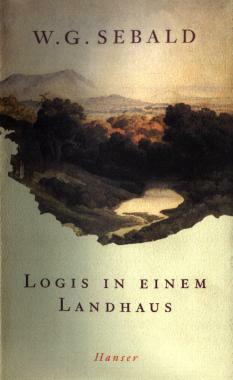 The final work by Sebald that remains untranslated is Logis in einem Landhaus (Munich: Carl Hanser Verlag, 1998). The volume includes essays on Robert Walser, Gottfried Keller, Johann Peter Hebel, Jean Jacques Rousseau, Eduard Mörike, and Jan Peter Tripp. Undoubtedly influenced by his earlier forays into fiction – Die Ausgewanderten (1992) and Die Ringe des Saturn (1995) – Sebald inserts images of all types into each of the essays in Logis in Einem Landhaus. Images include 18th century calendar pages, photographs of books, reproductions of historic etchings and drawings, a dozen portraits of the author Robert Walser at various stages of his life along with samples of his handwriting, examples of Jan Peter Tripp’s extraordinary contemporary etchings, and, in a typically Sebaldian move, an enigmatic, grainy photograph of a hot air balloon hovering over treetops. Furthermore, each of the six essays receives a large foldout image in full color. The only essay from Logis in Einem Landhaus to have appeared so far in English is the one on artist Jan Peter Tripp, which is included in the British and American editions of Unrecounted, the book on which Sebald and Tripp collaborated. The essay, originally titled Wie Tag und Nacht: über die Bilder Jan Peter Tripps, appears as Day and Night, Chalk and Cheese: On the Pictures of Jan Peter Tripp. It deals with trompe l’oeil, memory, and other Sebaldian subjects.This is the first book put out by Sebald’s new German publisher Carl Hanser Verlag and it is a beautiful production. It is bound in a dark, almost wasabi green cloth with a maroon and gold-stamped title on the spine.